At Saglo Development Corporation we’ve built a talented, experienced and passionate team of commercial real estate professionals, all committed to making every Saglo property a destination of choice for consumers. We pride ourselves on our strong work ethic and a high level of integrity, while we continually challenge ourselves to look for new and better ways to add value, enhance efficiency and increase profits for our retail partners. Jack is an active participant and sponsor of the International Council of Shopping Centers (ICSC) and he is deeply involved in the local community, as an active board member and sponsor of Big Brothers Big Sisters of Miami since 2004, and an active member of the Entrepreneurs Organization of South Florida since 2001. In addition to work and his community involvement, Jack enjoys spending time with his wife and children, exercising, and mentoring high school and college students. persistence and hard work he has earned a reputation of being one of the best retail leasing agents in Florida. Using a systematic approach and leveraging technology Hue is very well connected with the networks of commercial brokers, retailers, regional businesses, and property owners. Using his background in leasing and finance as well as his knowledge of retailers, Hue is able to put together deals that are sound fundamentally as well as financially. Hue is involved with the ICSC organization and has been speaker, discussion leader, event chairman, and moderator at prior events. Hue was raised in Miami attending Miami Palmetto Senior high school and is a graduate of the University of Florida studying finance. Some of his non-real estate interests include traveling, photography, and music. Carlos Guzman is the Vice President of Leasing for Saglo Development Corporation. He joined Saglo in 2014 bringing more than 15 years experience in Commercial Real Estate. Carlos is responsible for the Leasing Department and third-party Leasing and Property Management services. and started his career out of college as an associate at M2 Realty Corporation. He is a graduate of Florida State University with a Bachelor of Science in Real Estate and Multinational Business Operations. 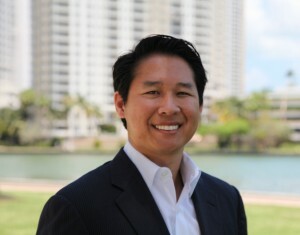 He is a licensed Florida Real Estate Broker and member of the International Council of Shopping Centers (ICSC). Carlos is fluent in Spanish and has been recognized by CoStar as a Power Broker numerous times throughout his career. Carlos is actively involved with Big Brothers Big Sisters as a mentor. Carlos is married with two young sons and during his free time likes to play sports and root for his favorite teams. Contact Carlos at 305-704-3112 or email carlos@saglo.com. Alyona has been working at Saglo Realty since November 2013 as an acquisitions analyst due to her strength in ARGUS and cash flow analysis. Alyona transitioned into retail leasing in 2014 and since then she has been a valued asset to the leasing team. 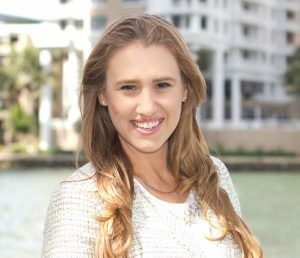 Prior to joining Saglo, Alyona earned a Master of Science in International Real Estate from Florida International University (FIU). She also holds a Bachelor of Business in International Business and Management from FIU. Alyona is certified in Argus DCF and has great knowledge of ACT database software. Additionally, she has great communication abilities and is fluent in English, Spanish and Russian. Alyona is very dedicated and competitive individual thanks to her athletic background in professional tennis. She traveled all around the globe participating in tennis tournaments including junior Rolland Garros, The US Open and Wimbledon, reaching top 5 doubles and top 50 singles junior world ranking. She approaches her real estate career no different than tennis career, with hard work and laser sharp focus being the foundation for success. Contact Alyona at 786-470-4906 or email at@saglo.com. 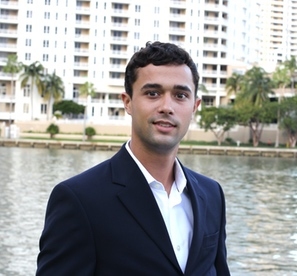 Luis Nazario is a leasing associate for Saglo Development. 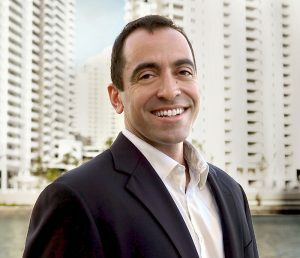 Luis received his Bachelors of Science in Political Science from Barry University, and later received his Masters in Business Administration from Nova Southeastern University to focus on retail development. He has over nine years of retail development and management experience and is translating that into retail leasing. He worked on the residential side of real estate for a year before realizing he wanted to use his past experience to influence his real estate career. Luis is very dedicated and driven to succeed from his background in triathlons, marathons and various fitness competitions. Contact Luis at 305-582-8270 or email Luis@saglo.com. As an Associate for the Saglo leasing team, Aniley Perez is directly responsible for leasing approximately 700,000 sq ft of retail shopping center space within Florida. 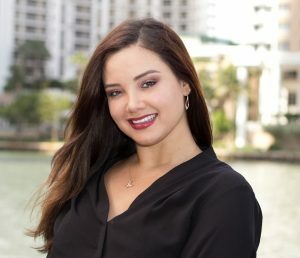 Prior to joining the Saglo leasing team, Ms. Perez served as a Leasing Associate, focusing on Landlord Representation in the retail sector for clients in the South Florida market. Her responsibilities included, but were not limited to, advising clients on marketing, identifying retail tenants for shopping center enhancement, assisting in qualifying prospects, negotiating leases, canvassing, and conducting market analyses. Ms. Perez is a licensed Broker Associate in the state of Florida and is an active member of the International Council of Shopping Centers (ICSC), Commercial Real Estate Women Miami (CREW) and the Florida International University Alumni Association. She holds a Bachelor’s Degree in Management, and earned a Master’s of Science in International Real Estate from Florida International University. This program honed her knowledge in commercial real estate development and overall financial principles. Ms. Perez is fluent in English and Spanish. Active in her community, she also serves on the Planning and Zoning Board for the City of North Bay Village where she resides. Contact Aniley at 305-318-9190 or email Aniley@saglo.com. 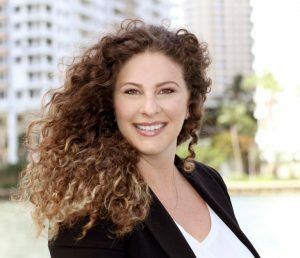 Michele graduated with a Bachelor’s degree from the University of Michigan in 2003 and a Juris Doctor degree from the University of Miami School of Law in 2006, where she was a first year Moot Court Competition Champion. Michele began her career in commercial litigation, representing clients in all stages of commercial litigation and in appellate work. Prior to joining Saglo Realty as a leasing associate, Michele’s work focused on bankruptcy and real estate law as well as commercial transactions. 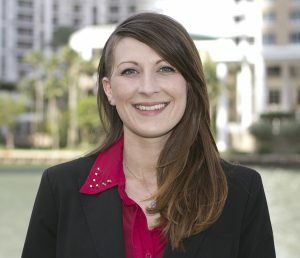 Michele gained invaluable experience negotiating and analyzing contracts, resolving disputes and handing complex real estate matters. Michele strives to positively impact her community through her work and volunteerism. Michele Hanash is on the Organizing Committee of the Heart in Hand Awards, which raises awareness and funds for the local nonprofit No More Tears, an organization dedicated to assisting and empowering victims of domestic violence and human trafficking. Michele also serves on the Remix Committee for the Perez Art Museum’s Art of the Party gala, their largest annual fundraiser. Michele is conversational in French and has a working knowledge of Spanish. Contact Michele at 305-902-8158 or email mh@saglo.com. Kristina Remington is the Director of Acquisitions at Saglo Development and has been apart of the Saglo team since 2014. Kristina has analyzed over 500 shopping centers using Argus DCF/ Enterprise and has been apart of several shopping center closings since starting at Saglo including May’s Crossing, Goldenrod Marketplace, Dunn Village, South Bay Plaza, Commonwealth, Lantana Village, Marietta Square, Shoppes at Armenia, Beauclerc Village and Florida Waters Shopping Center . Kristina is responsible for underwriting potential shopping center opportunities and completing the entire due diligence process for the properties that we are under contract on. 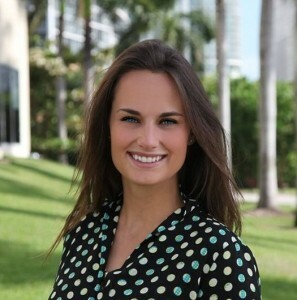 Kristina is a graduate of Florida State University with a Bachelor’s in Finance and Real Estate. She also is a licensed Florida Real Estate Sales Associate and member of the International Council of Shopping Centers (ICSC). Outside of work, Kristina is very involved in her community being an active volunteer for Big Brothers Big Sisters, and an annual participant at the Dolphin’s Cancer Challenge. In her free time, she enjoys paddle boarding, biking to the beach, and being outside. Contact Kristina at 305-704-3110 or Kristina@saglo.com. Carson Dowd is an analyst for Saglo Development Corporation. 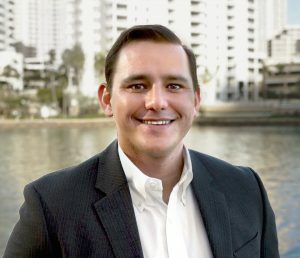 After a summer internship with Saglo and subsequent graduation from Florida State University, with a Bachelors of Science in Real Estate and Finance, Carson was hired in 2015 to perform property management and project management duties, however, found his calling in acquisitions as an analyst. Currently he handles the research and cash flow analysis that is needed before acquiring a property. Carson is a license Florida Real Estate Sale Associate and a member of the International Council of Shopping Centers (ICSC). Other than real estate, Carson enjoys exercising, gaming, and being with friends. Contact Carson at 561-797-7040 or email cd@saglo.com. Lenny Arias is an Assistant Property Manager for Saglo Development and has been with Saglo since 2017. 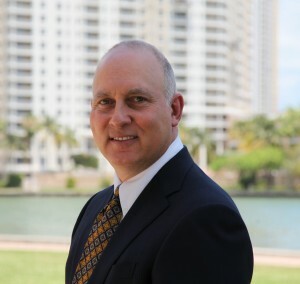 Lenny is a Licensed Florida CAM who transitioned to commercial property management when he joined our team. He is a versatile and result driven manager effective at satisfying tenant’s unique needs to maintain high occupancy levels. His background includes working 8 years with HOA’s where he successfully collaborated with HOA Board of Directors to recommend effective solutions regarding process improvement of property procedures for daily operations. He coordinated and monitored work assignments for contractors, outside vendors, and technicians for all work conducted on property grounds. He Interfaced with homeowners daily, providing on site customer service assistance and demonstrated detailed knowledge of property management. Lenny organized and coordinated several community events resulting in increased homeowner satisfaction. He is committed to providing quality service in all facets of property management. He is also fluent is Spanish. Contact Lenny a 305-704-3109 or Lenny@saglo.com. Phone: 305-704-3107 Fax: 305-704-3119 Email: Beatriz@saglo.com Beatriz Angulo- Rodriguez is the Controller at Saglo Development Corporation. She is responsible for the companys Accounting and Human Resources departments. Since joining Saglo in 2001, Beatriz has demonstrated great leadership, commitment and loyalty. Beatriz received her bachelors degree specializing in systems audit from the Externado de Colombia, one of the top three financing universities in the country. After graduation, Beatriz became a Certified Public Accountant in Colombia. Prior to joining Saglo, Beatriz had the opportunity to sharpen her internal control skills and gain experience working with multinational companies like, Mead Johnson International, Bristol Myers Company, Xerox de Colombia and Unisys of Colombia. Outside of work, Beatriz enjoys spending time with her husband and daughter as well as being part of the USA Swimming Association. Accounts Payable Phone: 305-704-3113 Fax: 305-861-2703 Email: Nerely@saglo.com Nerely Ruiz is Assistant Controller at Saglo Development Corporation and is responsible for day to day accounting operations as well as support to the Controller and Owner. Nerely is in constant communication with the tenants, giving them a direct connection to the landlord and supporting them in all their needs. She also works directly with vendors and on special projects for each of the Saglo properties, ensuring timely and accurate payments. Nerely joined Saglo after working as Controller for MC Fresh, Inc., a subsidary of Mitsubishi International. In her spare time, Nerely enjoys spending time with her son and traveling.